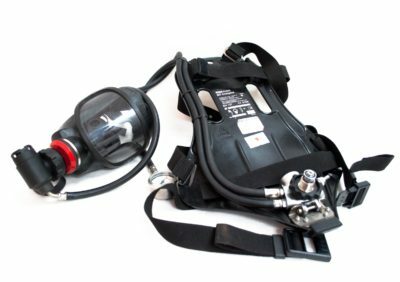 The AirGo compact SCBA preset is specifically designed for emergency response and escape. On ships or industrial facilities where such units are mandatory, the AirGo compact is an obvious choice. The lung governed demand valve AutoMaXX-AS is fixed to the medium pressure line. The no-frills system keeps costs at a minimum without sacrificing safety. The vital pneumatic and carrier components are the same as those used in the high end MSA presets, making AirGo compact a fully-fledged device for the toughest applications including firefighting.